Historically the currach served as both fishing vessel and general transportation along the many rivers of Ireland and in the coastal waters. 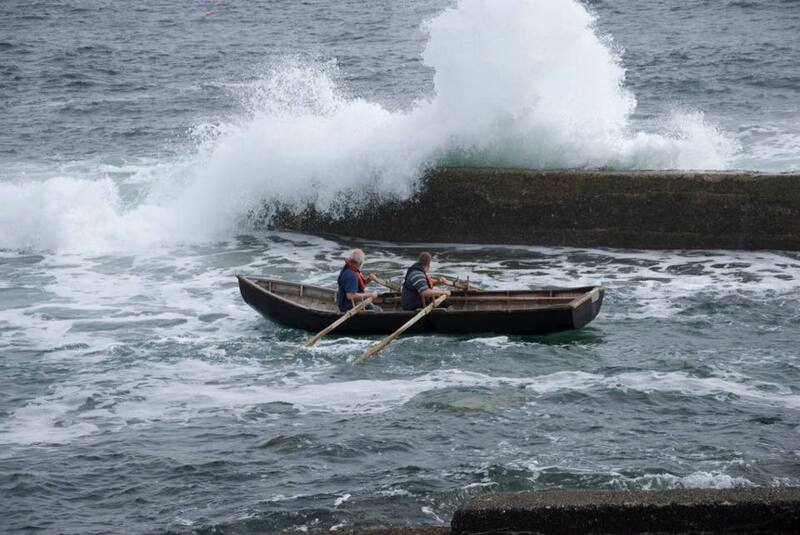 Currach racing today gets it start from the fishermen who used these boats. They would collect their catch, and at the end of the day race back to the harbor. The first boats in received the best price for their catch and a sport was born. The construction and design of the currach is unique to the western coast of Ireland, although the size and shape vary widely by region. Written records of the currach date from 100 BC. Early Gaelic accounts speak of large ocean-going sailing vessels roving the North Atlantic. One of these legends contests that St. Brendan, an Irish monk during the Middle Ages. was the first to discover America – in a currach. Rowing a currach is a different experience than rowing a shell or any other row boat. There are four fixed seats and two 8- to 10-foot oars per seat. Rowers start the pull leaning forward and "snap" their upper bodies back, keeping their arms straight until the last possible moment. Rowers sit up, push the oars forward and begin the process over again. The oars do not dig deep into the water, instead they skim just below the surface. This way, an oar won't get 'caught' in the water when a wave hits, thus disrupting the rhythm of the rowers.